Operating rooms are among the busiest places in a hospital. To minimize the risk of infections, it is critical that all OR staff have a share understanding of what surfaces should be cleaned, which tool is best, and how to ensure IP efficacy. An operating room is sterilized best when everyone works together in a team effort. This includes decontamination basics such as room-wide disinfection solution wipe-downs as well as more advanced IC tools like UVC disinfection that targets high-touch surfaces. While it might seem obvious, attending to the most basic OR cleaning and disinfection tasks should be the driver of any IC plan. OR lighting and floors are prime location for IP controls. It is essential to wash both stationary and moveable light reflectors with the manufacturer-suggested disinfectant solution. Likewise, floors must be cleaned thoroughly between surgeries. Using a wet-vac, combined with best-in-class disinfectants is the best way to ensure an adequate cleaning. No OR cleaning and sterilization process is complete without properly disposing of the cleaning materials. When cleaning is complete, throw away all disposable cleaning cloths and put reusable ones in a dedicated laundry bag. While its critical to ensure basic disinfection and sterilization procedures are in place, today’s OR staff also needs to rely on industry IC innovation to reach their prevention efficacy goals. UVC disinfection should be a key component of your IP plan. 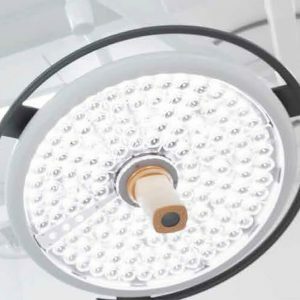 Incorporating UVC disinfection that provides the most direct pathogen-eliminating light as possible is one good strategy for high-touch surfaces. Select a UVC system that automatically captures and reports disinfection data, ensuring your IP team has the proof of compliance data it needs for efficacy reporting. By ensuring your OR team works together to incorporate the best available IC tools will help drive HAI rates down and empower your hospital to continue delivering effective care to patients. Download our Room Readiness Checklist for your team today.